Brickhouse has an all new menu, launched just this week, and I was invited to try it out! I was happy to see that Brickhouse is still as popular and packed as ever, and that despite changes to the menu, some of the old favorites are still there (the watermelon salad, the mexican street corn). It was the first time that I met some of my fellow Hong Kong bloggers, and had very interesting conversations with G4Gary and Steph’s 852 Diary. It’s quite remarkable how different the dynamic is at a table full of food bloggers – I could talk about food, for 2 hours, and NOT feel like I was over-talking the subject! I had to wait for my turn to take a photo of the dish, and with such a large group, we had the chance to try a wide variety of dishes instead of having to make hard choices. 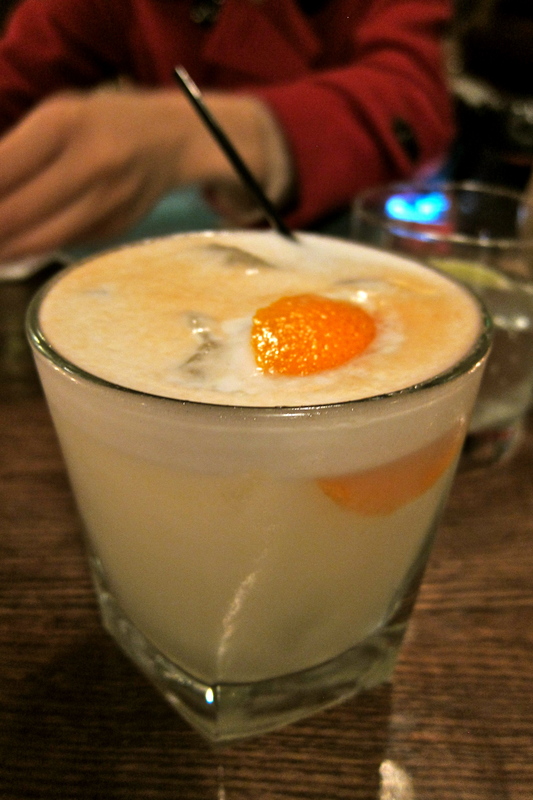 I got started with a Pisco Sour – the Brickhouse version was yummy from first sip to last. The egg white gave it a certain creaminess, the lime a nice citrus kick, the sugar cane a different kind of sweetness. Like a Latin American Pina Colada, but healthier and not as sweet. They also have some pretty cool sounding beers that I’ve never seen before – fancy a Trout Slayer, Bohemia, or perhaps a Great White Shark? For once, I was actually on time for dinner (shocker! 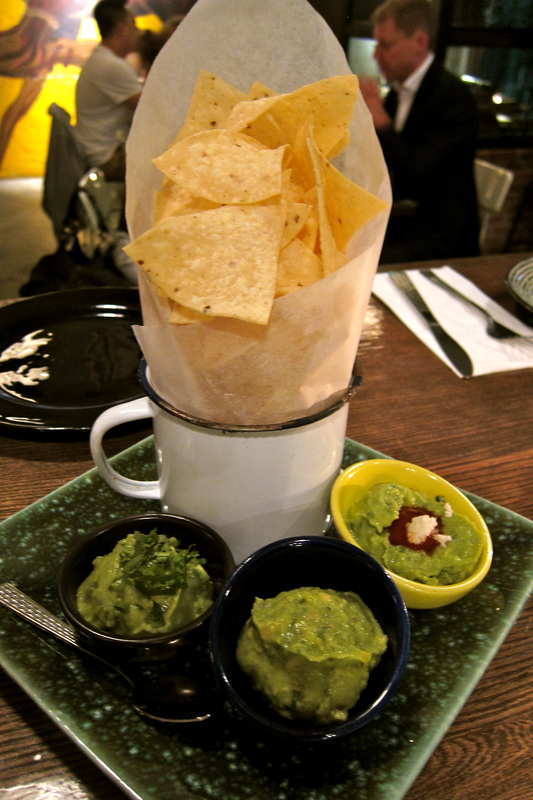 ), and whilst we were waiting for the others, we sampled their Trio of Guacamole, served with their stone ground chips – fresh and crunchy with just a hint of salt. I’m a bit of a chip-fiend, and was curious – although not made in house, the organic chips are carefully sourced, received raw and fried in-house. 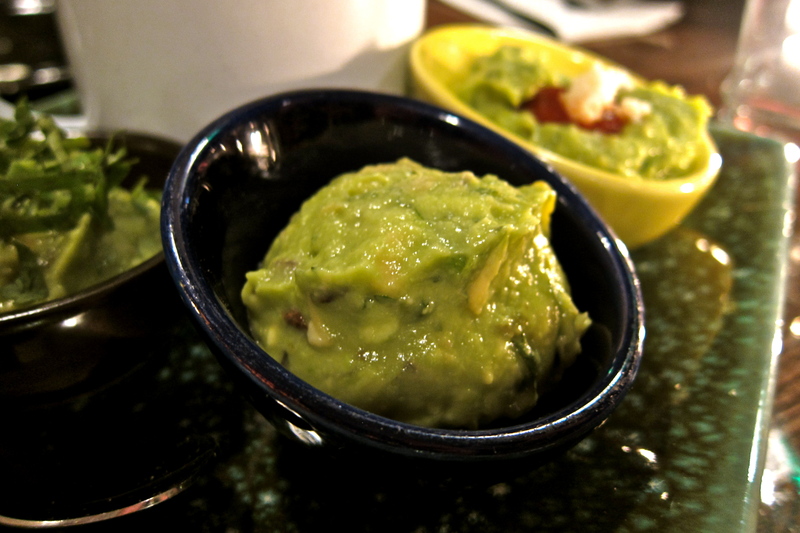 The trio was comprised of a traditional guacamole, a fruit guacamole, and a chipotle guacamole. 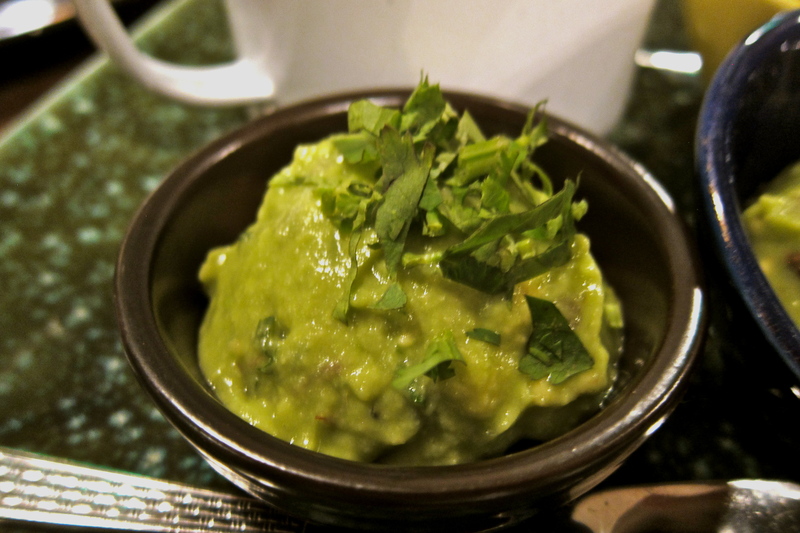 Traditional: pure avocado with some cilantro mixed in there. It was nice and creamy but a bit on the salty side for me. Fresh Fruit Guacamole: I’ve never encountered a guacamole with fruit in it, but actually the combination works quite well! Chef Austin Fry adds whatever fruits he feels is best for the day, and the mix of textures, the tanginess from the pineapple and the crunch of the apple was quite lovely! It was definitely my favorite of the three. 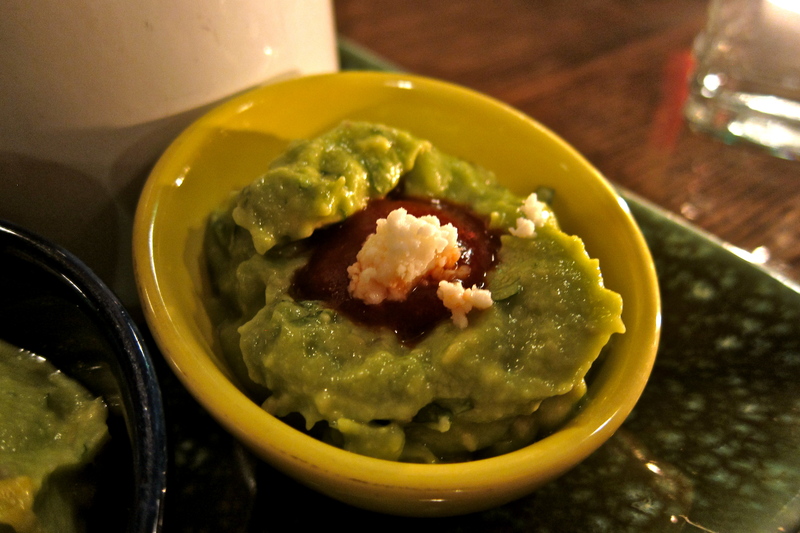 The chipotle version was the same traditional guacamole with a chipotle and fresh cheese topping. The chipotle added a nice little bit of zing, but otherwise it was pretty similar to to the traditional. Perhaps it was the bright orange plate, the standout colour of the purée, or the blood red beet vinaigrette but I think this is one of the brightest salads I’ve ever seen. And you know what they say about vegetables – the more colourful they are, the better they are for you! It was a great way to start the meal. 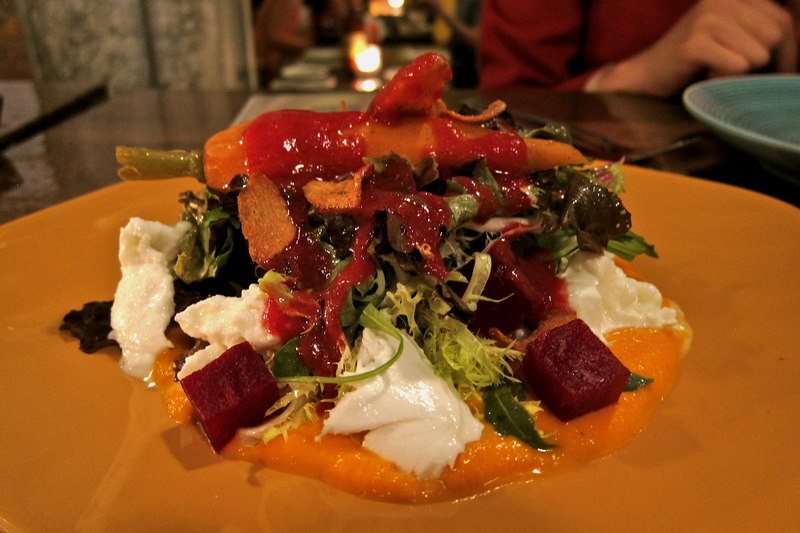 Epazote braised carrot, mozzarella, roasted beet, habanero-carrot purée, mixed field greens, beet vinaigrette and crispy garlic – all those ingredients seem a lot for a salad, but all the elements mix well together. I could order that slightly piquant puree just by itself, it’s so good! In the salad, it provides that little bit of flavour and tingle on your tongue without stealing the show. 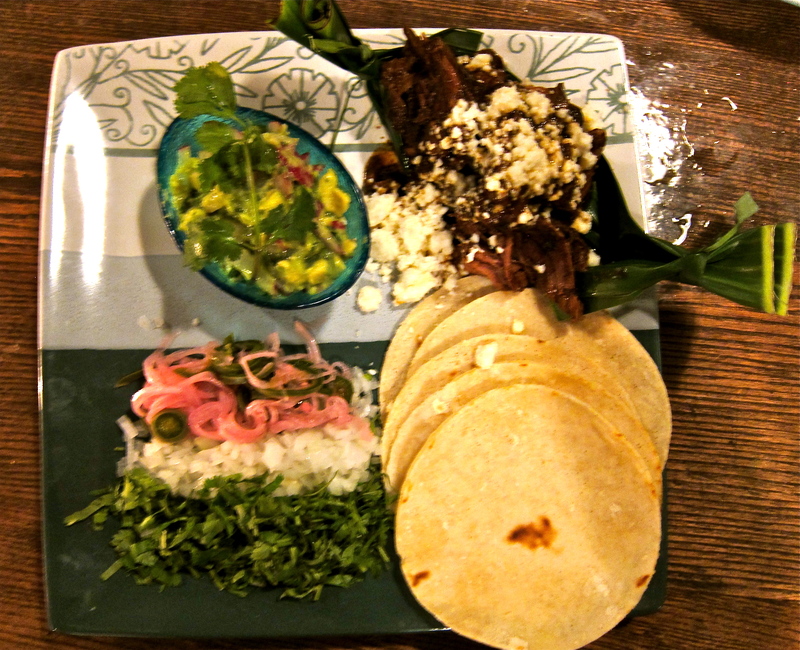 Oxtail salsa, chimichurri, epazote roasted tomatoes, pungent herb salad, corn tortillas. Oh my goodness. 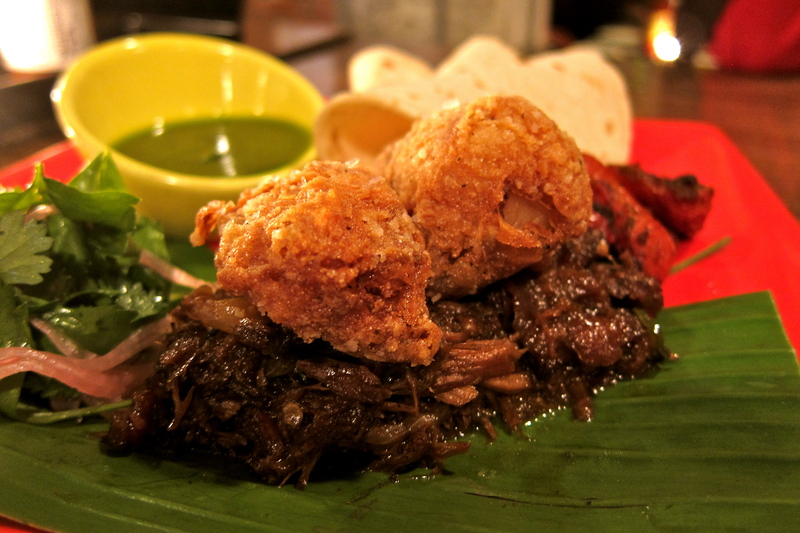 The slow-cooked oxtail melts in your mouth and the marrow is so rich – lightly dipped in flour and flash fried to give an nice juxtaposition between crunchy and smooth. The slight bitterness of the herb salad really balanced out the richness. A truly standout dish. Chef Austin was really quite proud of his tomatoes, and made a point of singling them out. They had been roasted slowly for a minimum of 12 hours, and dusted with epazote, a herb native to Central America, with flavour similar to that of mint. 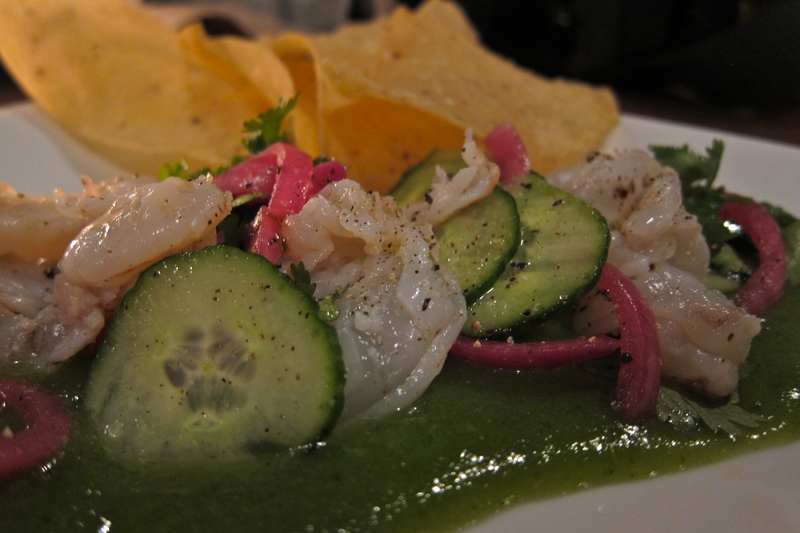 Shrimp, cucumber water, pickled red onion, cilantro, chili oil. I really do enjoy a beautiful plate, and this shrimp ceviche is well presented, rather than just mixed and plonked in a bowl. I also prefer these hard corn tortilla chips, they aren’t as heavy and don’t fill you up as much as the soft ones. I’ve always said, you can’t go wrong with cheese and onions! Well, I’ve actually never said that, but either way, you can’t. 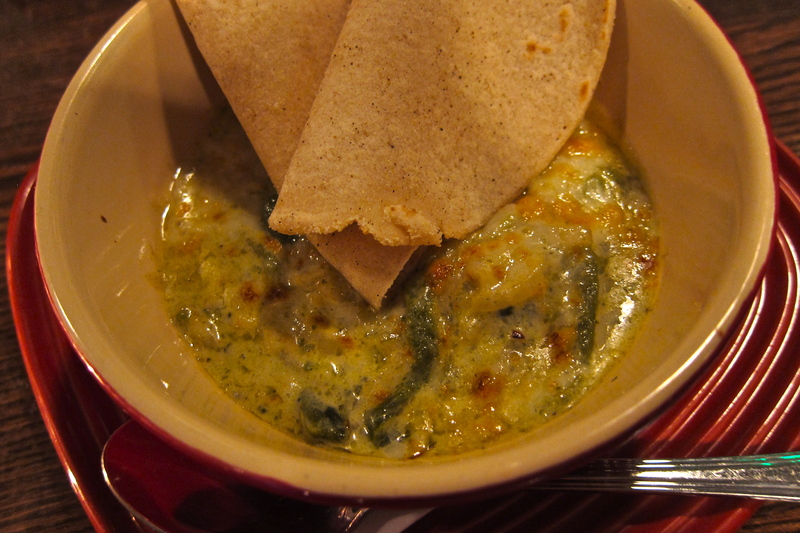 Melted manchego laced with Spanish onions, mild fire poblano chili peppers and a unhealthy touch of cream, this was an awesome side dish. I asked for an extra portion of those stone ground chips to scoop it up! 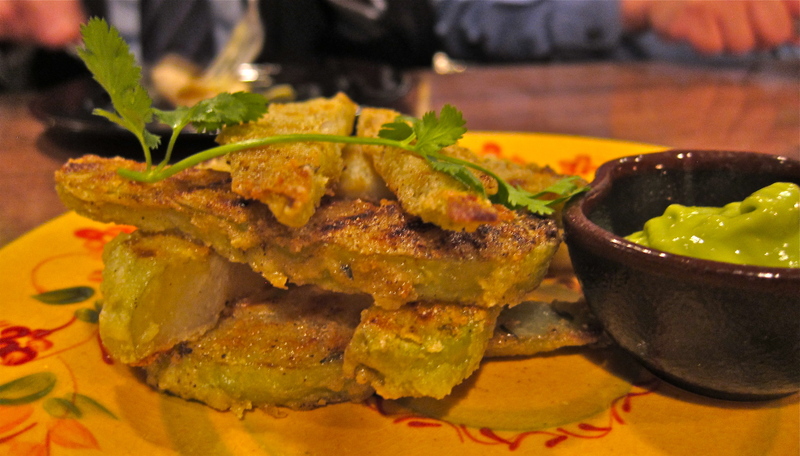 Chayote is a Central American plant of the gourd family, and has the soft texture similar to that of a bitter melon. It almost melts in your mouth as you chew. 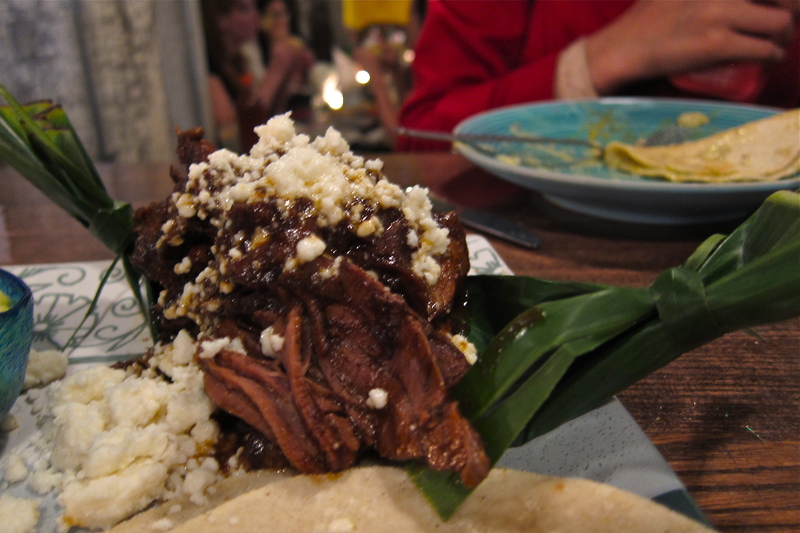 Next up was the main course dish, the barbacoa tacos. 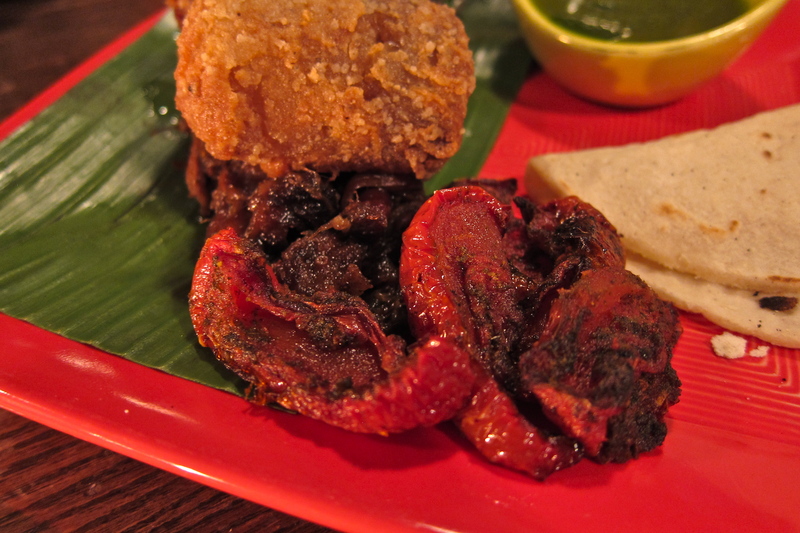 ‘Barbacoa’ is the term from which ‘barbecue’ is derived from, and slow braising a leg of goat is not what you see every day at a Hong Kong restaurant. 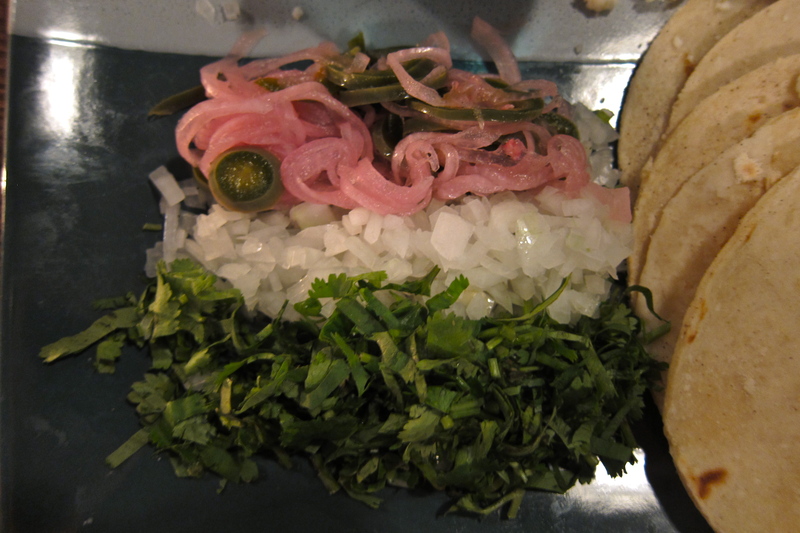 I loved the radish and avocado salsa, and helped myself to a generous serving of those addictive serrano pickled shallots. Because it has a relatively lower fat content, goat meat is prone to dryness if cooked at high temperatures – this braised goat was still quite tender and the sauce was delicious, it was my least favorite dish of the evening. 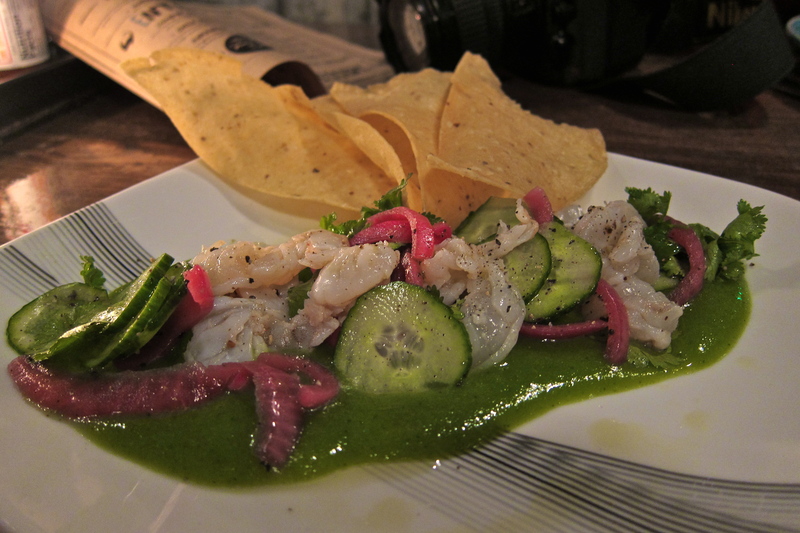 Brickhouse really loves their Serrano pickled shallots – and with good reason, as they are seriously addictive! 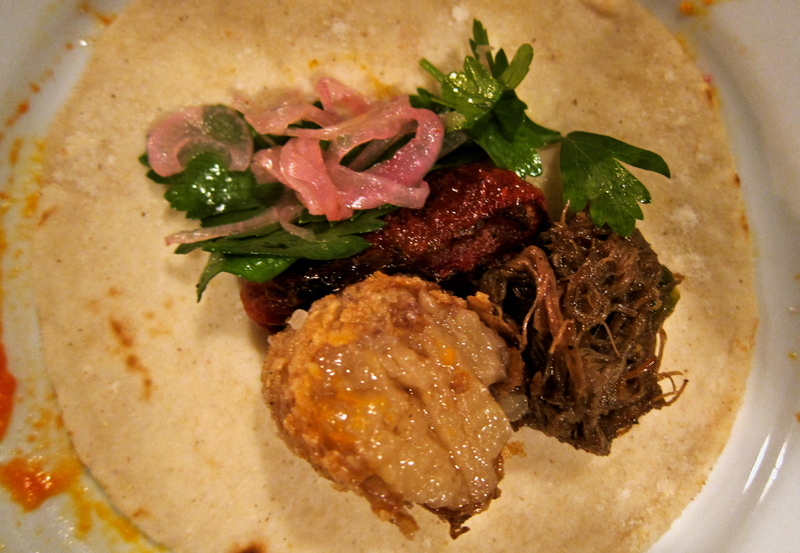 The shallots are used in the Bone Marrow Tacos and the Barbacoa Tacos, and each time, they add to the dish an extra layer of flavour and a little bit of crunch. Dessert was one of my top 3 dishes of the night! Rice pudding just brings me right back to my childhood, the goats milk caramel is syrupy sweet goodness, and they’ve spiked the house made vanilla ice cream with mezcal (tequila). 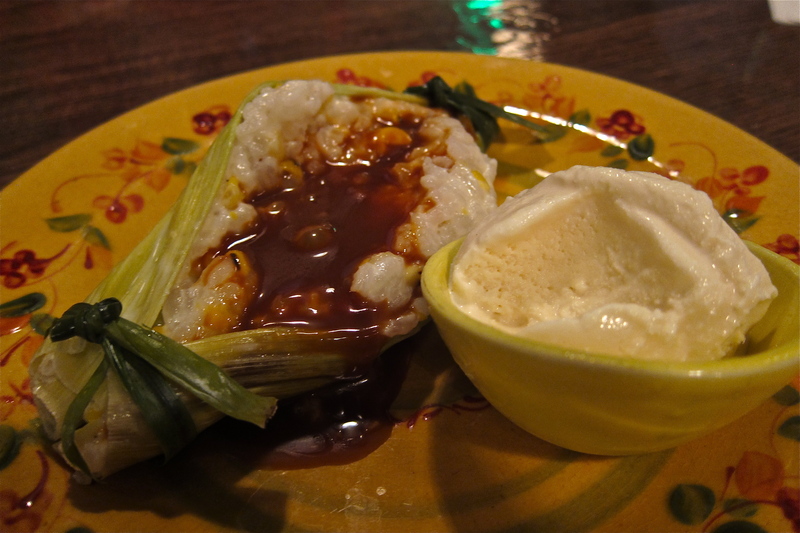 Again, the presentation of the rice pudding in a corn husk really stands out. Even if I go back to Brickhouse just for a drink, I’ll be ordering one of those. The new menu is an improved version of the old one, in my opinion. The dishes are more sophisticated, and there is something for everyone, even a good selection of vegetarian options too. 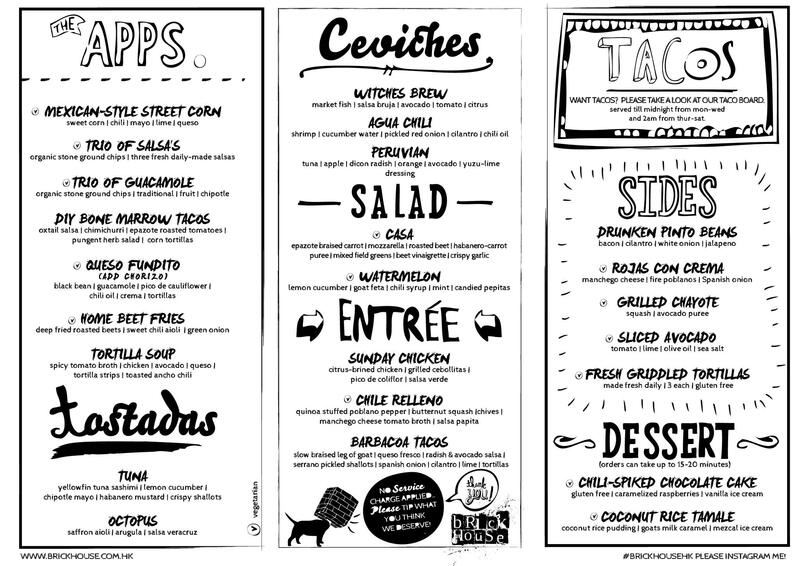 My favorites were the bone marrow/oxtail tacos, that bowl full of cheesy/creamy goodness (Rojas con Crema), and the rice pudding. 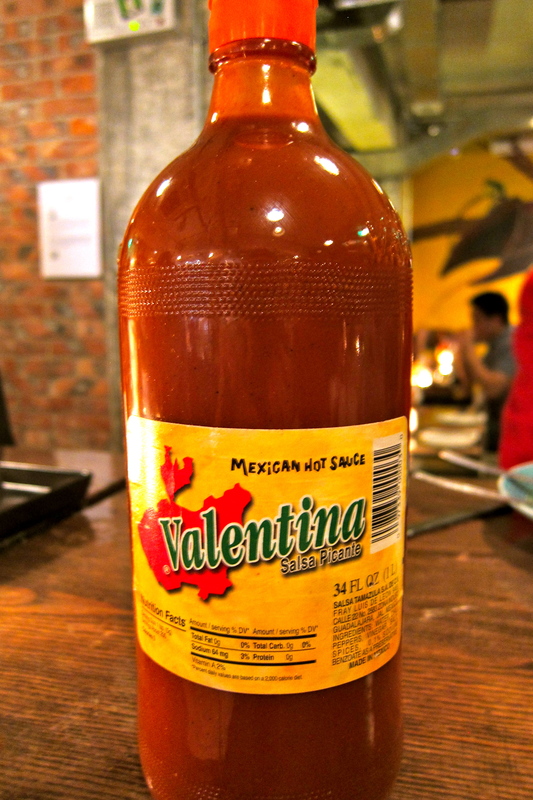 UPDATE on 15th April 3013, 3 days later… : I went back to Brick House with some girlfriends after they read my blog and were craving tacos! 🙂 I realised that the regular portion, and presentation of the DIY Bone Marrow Tacos on a busy night are different from the night of the tasting event. The bone marrow was a tiny portion, and the dish was messily put together – rather disappointing considering this was my favorite dish. Happily, the Rojas con Crema and the Casa Salad were exactly the same and went down a treat! Isn’t this just a paid advertorial? Restaurant invites food critic/blogger to eat free food and receives a positive review? Ooooooo that’s a bit of a harsh comment, don’t you think Jeff? Are you accusing me of selling out for free food? Look, I thought about it as well. This is the first time I was invited to something like this, I truly had a great time, and my review reflects this. The food was also really tasty, you should check it out some time. Yea, sorry Jen. I didn’t have my coffee yet – my bad haha. I think my comment is more directed at the industry in Hong Kong, where paid advertorials are the norm and consumers are left with little credible sources for where to spend their hard earned dollars. Michelin reviewers make it a point to always pay for their meals and try to be anonymous for that reason (though the Michelin guide suffers from it’s own issues). Agreed that Austin puts out good food, albeit overpriced, but we have HK landlords to thank for that. I am sorry to read your update on the Bone marrow tacos. This must have been a one off. Chef Austin has been working hard at this dish. Portions always have the same size and presentation and I share your comment with our Kitchen. Please come again for a blind tasting 😉 thanks a lot for your feedback!